If you're anything like me, you're sick of being told what to do and when to do it. Not just by your kids, either. Even by the calendar. Seems there are all kinds of holidays, for any number or things official and religious and just plain fun. And, of course, they all come with rules about the parameters for celebrating or following them. I'm a holiday lover and yes, I join in. I dutifully made corned beef and cabbage with soda bread just over a week ago for St. Patrick's Day. A few days later I walked outside without a jacket and served my Spring Fever Cookies for the first day of spring. But once, just once, I'd like to be the one to name the holiday and make the rules. According to multiple web sites, and we all know that if it's on the internet it's true, today is Make Up Your Own Holiday Day. No, I'm not delusional, google it. I'll wait. Yes, there's something ironic about my following the rules by taking part in a holiday that's about me making up the rules and naming a holiday. HA, did you get that? That won't stop me. Or many of my friends, for that matter. If you look down this page you'll find links to their Make Up Your Own Holiday Day posts too. ~ Celebrate Curly Haired Friends Day. ~ Drink Coffee Until You Burst Day. ~ Brown Eyed Girl Day. In the end I had to admit that although I'd love to see those things happen, they may be a little . . . how should I put this . . . self centered? Not that there's anything wrong with that, but if I want people to join in, I'm guessing I have to consider what might appeal to the masses. As I went through my day, doing errands, chores, dealing with the family's needs, I thought about it. And then I sat down to watch the news and I knew. The perfect holiday. Mum Day. Mum? as in Mom? Mother? Mama? Ma? Mommy? Someone tell this woman we already have a Mother's Day. Yeah, yeah, mothers deserve way more credit than they get, but when it comes to a day set aside to celebrate them, well, there already is one. So no, although I think every day should be Mother's Day, that's not at all what my holiday is about. I'm not going out on this unique challenge with a been-there-done-that day we already celebrate. That's just lame. No, I'm all for honoring that other mum. You know, mum. As in silence. How do you celebrate? Shut up. No news, real or fake, no complaints, no bullying, no bigotry, no whining, no moaning, no protesting. Nothing. For just one day I think we could all use a little tranquility. A break from all the noise, tumult, commotion, and din. For one short glorious day let's all just be quiet. As with most holidays, you can take this one as far as you want. Social media, texting, participate or not. Take a break from it all, though, and you just may find the benefits worth your while. Do yoga, meditate, take a nap, go for a walk, or bake, there's so much that could get done if we could all just zipped it for one glorious day. Be sure to bake something you like. After all, there's no reason not to honor Mom while you're honoring the mum. Dawn of Spatulas on Parade shares Victoria's Secret Fruit of Loom Party. Lydia of Cluttered Genius shares National Parents' Nap Day. Rena of Wandering Web Designer shares It's My Holiday & I'll Cry If I Want To. Jules of The Bergham Chronicles shares Holiday Dreaming. *Melt the butter and chocolate chips in the microwave, stirring every 20 seconds until completely smooth. Whisk in the vanilla, then mix in the sugar. *Mix in the eggs really well, then add the flour. Once fully incorporated, gently fold in the crisped rice cereal. *Pour evenly into the baking pan. Bake for 30 minutes or until the center is completely set. Cool completely before cutting. This recipe sounds like a yummy Nestle's Crunch bar, bar cookie, otherwise known as a brownie!!! I think all your categories should be holidays and it is not in self interest because there are at least 2 of us! Ha ha, yes, lets do it, all of them! Mum's the word but I can't stay silent on these delicious looking brownies. I might have to have one. Yes I sure I need one. Do you deliver? I don't think it's far, by plane that is. I'll wait. AND I see we both had several ideas floating around in our heads to choose from. Love it! Yes, I think we all did. 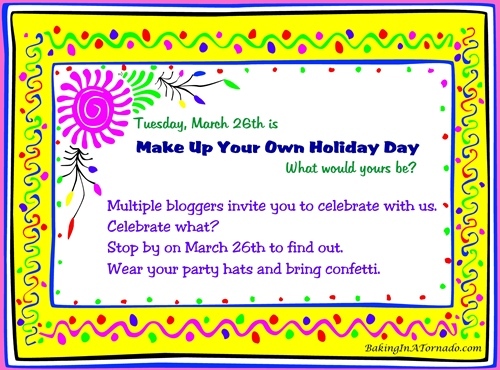 Maybe this "make up your own holiday" thing should be monthly instead of yearly so we can try out all of our options. Mum IS the word! This is brilliant. So brilliant. A day of peace. I fully support this. Yes, we need it right about now, pretty badly! I tried complete silence (mum-ness? ), but failed miserably and turned the radio on for background noise. Tomorrow I can try again. Well, it may be a process . . .
Brownies are forgiving of playing around with the ingredients, and, much as I love the idea of these brownies (I also love Nestle's Crunch) I have to try, somehow, to make these more Weight Watchers friendly. Hmmm, a challenge. Because I really want to make these! You're on your own there, but let me know if you do it.